Ultimately, a good website should make you money—not just take up digital space. Improving the bottom line is what we’re all about here at Everything Online. 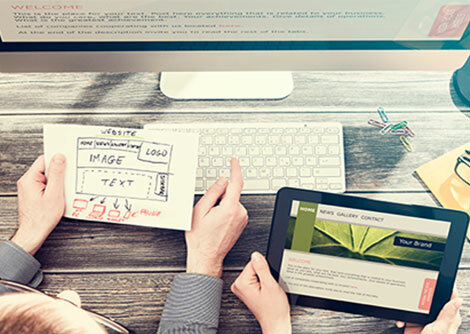 Our designers and developers are ready to help your company establish an online presence that doesn’t just look good, but actually converts visitors into paying customers. Whether your company lacks a website or simply needs a money-making refresh, we invite you to contact us today. The EverythingOnline team has provided excellence in digital marketing for more than 15 years now—and that includes excellence in website design. The services we offer cover everything from website consultation to Wordpress configuration. We are also experts in designing truly effective sales pages and landing pages. EverythingOnline is the website company you choose when you're looking for results—plain and simple. We're here to provide you with the tools you need to draw in customers and get them to pick up the phone and call you, or else buy a product straight away. By choosing EverythingOnline to develop your company website, you'll get a site that’s designed to be a true money-maker—period. EverythingOnline provides a comprehensive array of digital marketing services, but what we're best at is listening to the client's needs and recommending a cost-effective course of action. We don't believe in just throwing money out there and hoping it makes a difference. We believe in doing the things that are proven to generate ROI for our clients—and our website development services are no different. Learn more about our website design services, and about how you can get a website that's made to make an impact on your bottom line. Contact the team at EverythingOnline today!